"Sharavana Namah. My awareness is unbounded and focused." 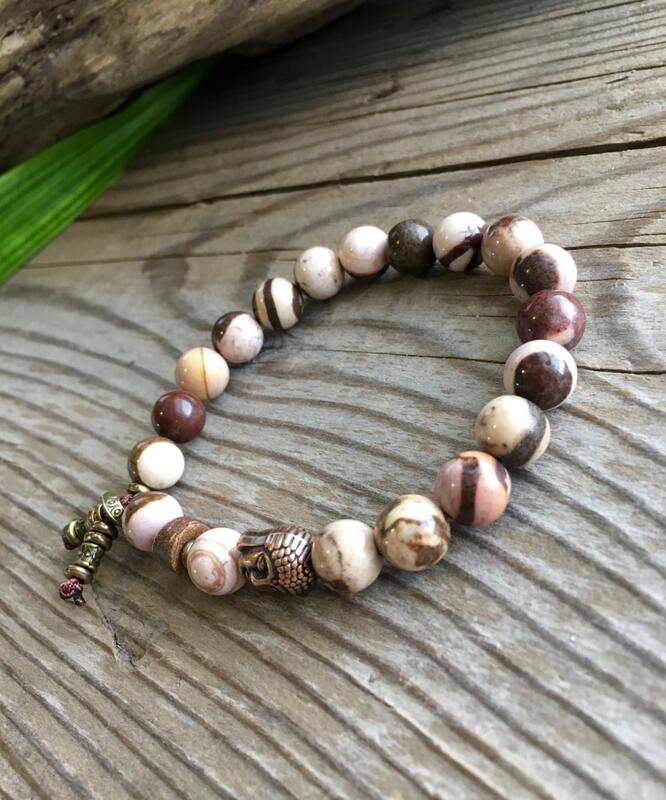 The Energy Balance Mala Bracelet features beautiful cocoa swirled Zebra Jasper along with a reversible antique copper Buddha to give you a boost of awakened energy. This one is a powerful little thing. You will feel it. 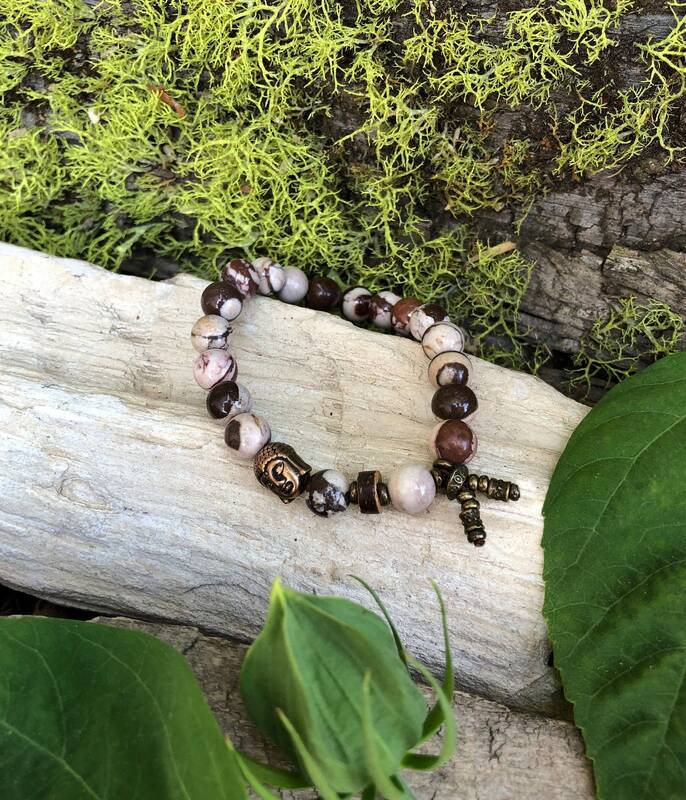 Zebra Jasper, the Yin-Yang gemstone, is all about balance. It possesses balanced qualities of opposing, yet complementary forces. When combined, an equilibrium is reached and we are awakened to infinite energy and Universal love. Zebra Jasper is mood lifting, energetic and motivating. It is one of the best stones for pain management. 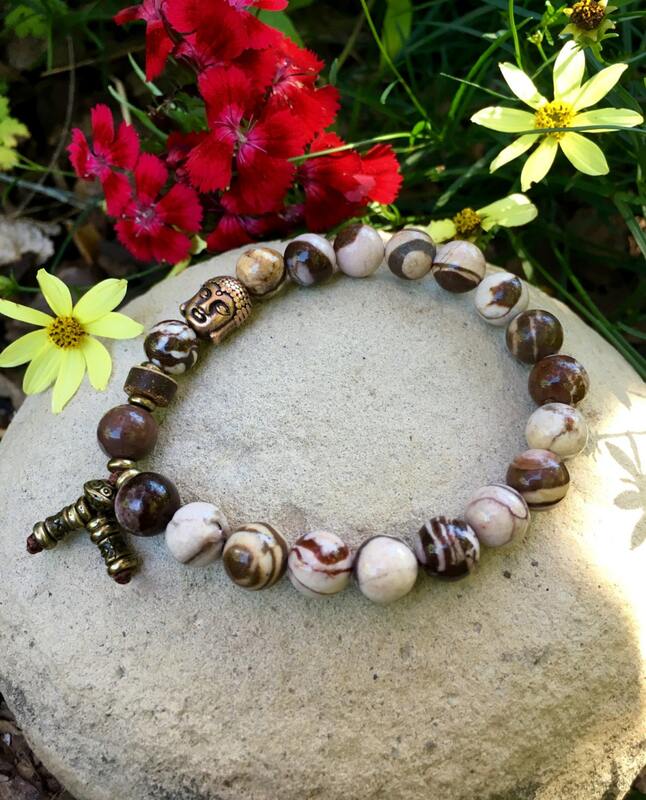 Zebra Jasper can also show us our own true natures and help us see past illusion. It is a grounding gem, helpful in relationships, the workplace, and other environments. Useful in meditation, it encourages one to see the positive spiritual nature of all things. It protects the aura and helps us to avoid over-thinking. Crystal healing has been used for thousands of years, dating back as far as the Ancient Sumerians. Each variety of crystal has a unique internal structure, which causes it to resonate at a certain energy frequency. It is this vibrational resonance that gives crystal gems their healing abilities. Crystals and gemstones alter and shift our vibration by awakening the cells within our bodies that are vibrating on a lower frequency. They engage with our cells to lift our vibration so that they all are vibrating on a similar wavelength. This creates a peaceful environment within the body, enabling well-being to flow. Beautiful bracelet!! Really feel it's positive energy.